Teach the advantage of playing fast, and practice playing fast, their goal is to score in the first 8 seconds of the shot clock. Play up-tempo while implementing ballscreens (see Quick hitters - Enfield ballscreens). 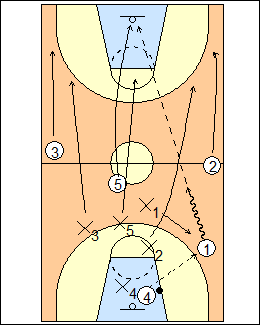 5 on 5 fullcourt, losers run, if a team scores within 8 seconds (shown), count the basket, they get the ball back out top, and can score two baskets in the same possession. Coach can give the offence up to 9-10-11 seconds if they are playing fast. Team O now runs a specified halfcourt ballscreen (or other) set, on a stop or score team X attacks the other way, looking to score in the first 8 seconds and keep possession. Any time a team does not score within 8 seconds (i.e. doesn't shoot), set up and run the specified set. Also run the set when the ball goes out of bounds, the team in possession sets up halfcourt (don't inbounds). 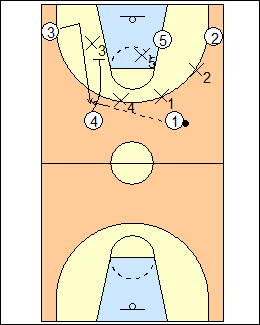 Run the ballscreen set to start play, or one team makes a layup, the other team inbounds and pushes it to see if they can score quickly, or just brings it up and runs the set. For other start-up options, see Fast break - Circle break. Also see Fast break - Enfield 5 on 0, Scrimmage - Stop and break (fullcourt play until one team scores and keeps possession).